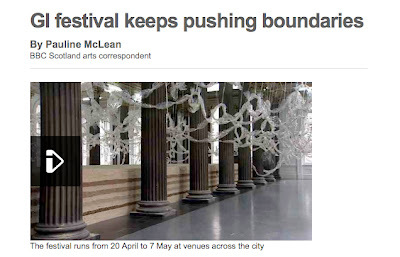 We've been featured by the BBC again... this time on their website - in an article by arts correspondent Pauline McLean. "Down on the Clydeside, Matt Baker and Tara Beall commandeered a ferry, and Captain Thomas - not to mention some singers - to give us a taste of their work Nothing About Us Without Us is for Us. They've spent months working with the community in Govan to create a piece which will involve firing language across the river, using unusual or obsolete technology - everything from choirs to flags to medieval catapults (their trebuchet is well under way in a nearby lockup). The results can be seen on 28 April in a busy day of activities."